Have you ever wanted to put plants inside your home but don’t have the time to maintain them? Or you just feel you’re not a green thumb? Take heart because there’s a simple solution at hand. We’ve got some great tips here on how to add some greens in the different rooms of your home. You don’t have to get the big plants or flowering plants but you just need the succulents. Succulents? Some of you may not be familiar with this but they’re also plants. Specifically, they’re the small and fat ornamental plants that often grown in the desert and come in different colors. They’re thicker, need little maintenance and can even survive the winter weather. Aloe vera and cacti are some examples of a succulent. This kind of plant normally retains water in their stems and leaves and as such, they don’t really need daily watering unlike the usual plants. It is also this ability to store water that makes them thicker and fleshy. 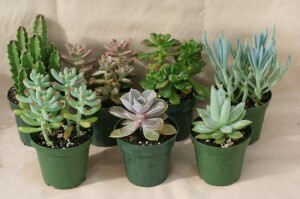 Succulent plants are very attractive because of their unusual appearance and varied colors. Different kinds can be mixed in one container to create a small and lovely garden. There are various ways in which you can plant them. You can use a large box if you want to mix different types or you can put them separately in a container. If you have a big glass jar, you can put one or more succulents in there as well. You can even plant them in a large rectangular box or vertical planter and then position the box against the wall. You can also add a small ceramic figurine of an animal in your planter to make it more attractive. Be creative. Browse through the internet for some great ideas. Teresa is a freelance blogger, mom of two and a green advocate.